Daniel and Lorrin break down the different types of diabetes and explain how you can best manage diabetes. What's That Mean? Ever confused with medical jargon? Daniel and Lorrin are here to help! The main symptom is itching. If it doesn't itch, it's not eczema. With flare-ups (itching attacks), the rash becomes red or even raw and weepy. Onset: Average onset at 3 months old. Range: 1-6 months old. Usually begins by 2 years old. Location: Classic eczema starts on the cheeks at 1 to 6 months of age. It can spread to the rest of the face. In infants, the outer surfaces of the arms and legs also become involved. 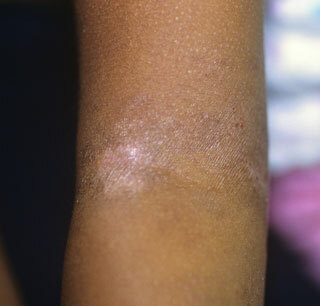 In older children, eczema is found in the joint creases. The elbows, wrists, and knees are the most common places. The rash is usually the same on both sides of the body. A type of dry, sensitive skin that children inherit. Flare-ups are from skin contact with soap, shampoo, pollen or other irritating substances. About 30% of babies with severe eczema also have food allergies. The most common is cow's milk. Over 10% of children have eczema. It's the most common skin condition of the first 10 years. Soaps. Never use bubble bath. It can cause a major flare-up. Pollens. Keep your child from lying on the grass during grass pollen season. Animals. Avoid any animals that make the rash worse. Foods. If certain foods cause severe itching (flares), avoid them. Wool. Avoid wool fibers and clothes made of other scratchy, rough materials. Dry Air. Use a humidifier if the air in your home is dry. Herpes Virus Infection (Serious). Keep your child away from anyone with fever blisters (cold sores). The herpes virus can cause a serious skin infection in children with eczema. Eczema is not caused by laundry soap you use to wash clothing. Food allergies are a factor in 30% of young children with severe eczema. This factor is mainly seen in babies. The main allergic foods are cow's milk and eggs. The main symptoms are increased skin redness and itching. Some parents report these symptoms start during or soon after the feeding. The eczema becomes easier to control if you avoid the allergic food. Remove the suspected food or foods from your child's diet for 2 weeks. The eczema should greatly improve. Then give your child that food when the eczema is under good control. This is called a "challenge." If the food is causing flare-ups, the eczema should become itchy and red. The flare-up should occur quickly within 2 hours of eating the food. If this occurs, avoid giving this food to your child. Talk to your child's doctor about the need for any food substitutes. If the eczema does not flare-up, your child isn't allergic to that food. Eczema is a chronic skin disease. So, you need to learn how to control it. Itching attacks (flare-ups) are to be expected. The goal is to treat all flare-ups quickly. Reason: To prevent skin damage. Mild Eczema. Just need to use a moisturizing cream and to avoid flare-up triggers. Moderate Eczema. Also need to use a steroid cream and bedtime allergy medicine. Severe Eczema. Also may need antibiotics for a skin infection caused by Staph bacteria. This infection starts in open skin from severe itching. All children with eczema have dry sensitive skin. The skin needs a moisturizing cream (such as Eucerin) Apply once or twice daily. Apply the cream after a 5 or 10-minute bath. To trap moisture in the skin, apply the cream while skin is still damp. Do this within 3 minutes of leaving the bath or shower. The steroid cream should be applied to any itchy spots first. Then use the moisturizing cream as the top layer. While most parents prefer creams, moisturizing ointments are sometimes needed in the winter. An example is Vaseline. Caution: Never stop the moisturizing cream. Reason: The rash will come back. Itchy skin is the main symptom of eczema. Steroid creams or ointments are essential for controlling red, itchy skin. Apply steroid creams only to itchy or red spots (not to the normal skin). Most children have 2 types of steroid creams. (1) A mild steroid cream is used to treat any pink spots or mild itching. This is often 1% hydrocortisone cream (such as Cortaid). No prescription is needed. (2) Another stronger steroid cream is needed to treat any spots with severe itching. This is a prescription steroid cream such as Synalar. Never apply this stronger cream to the face. Apply these creams as directed or 2 times per day. After the rash quiets down, apply it once per day. After 1 good week just use moisturizing cream. Give one bath a day for 10 minutes in lukewarm water. Reason: Water-soaked skin feels less itchy. Follow the bath with a moisturizing cream (such as Eucerin) to all the skin. Avoid all soaps. Reason: Eczema is very sensitive to soaps, especially bubble bath. There is no safe soap for young children with eczema. They can be cleaned using warm water. Many children with eczema need an allergy medicine by mouth at bedtime. Reason: Scratching in bed can cause severe skin breakdown. It may also interfere with falling sleep. Give the med your child's doctor wanted you to use for itching. If none was suggested, you can try Benadryl at bedtime. No prescription is needed. Caution: Do not use if age is under 1 year. Reason: Benadryl is a sedative. Give your doctor a call for advice. Playing in the grass, being around animals, or swimming can cause increased itching. For itching from these causes, give your child a quick shampoo and shower. At the first sign of any itching, use the steroid cream. Put it on the areas that itch. If unsure, apply 1% hydrocortisone cream (such as Cortaid). No prescription is needed. Keep your child's fingernails cut short and smooth. Ask older children to try not to itch, but never punish for itching. For constant itching in young children, cover the hands with socks or gloves. Use for a day or until the itching is brought under control. Provide extra cuddling during this time. Eczema cannot be spread to others. Children with eczema do not need to miss any child care or school. Eczema is a chronic condition. Around the teen years, about half get over their eczema. Many children who have severe eczema as babies develop asthma and nasal allergies. Some flare-ups of eczema cannot be explained. But others are triggered by things that can be avoided. Avoid chlorine in swimming pools and spas, harsh chemicals, and soaps. Never use bubble bath. It can cause a major flare. Keep your child off the grass during grass pollen season. Avoid any animals that make the rash worse. If certain foods cause severe itching (flares), avoid them. Wear clothes made of cotton or cotton blends as much as possible. Avoid wool fibers and clothes made of other scratchy, rough materials. They make eczema worse. Try to avoid excess heat, excess cold and dry air (use a humidifier). Avoid over-dressing. Heat can make the rash worse. Caution: Keep your child away from anyone with fever blisters (cold sores). The herpes virus can cause a serious skin infection in children with eczema. 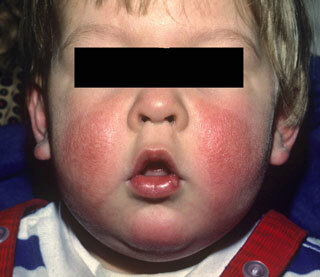 This is how eczema can appear on the cheeks of a child. The skin is red, dry, cracked and swollen. Your child may find it itchy. This shows eczema in the elbow crease of a teen. The skin is dry, cracked and swollen. It may be itchy. 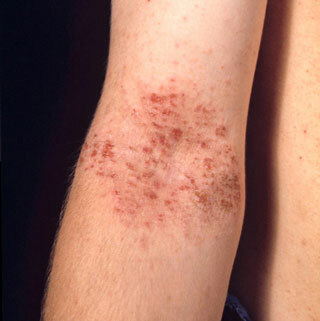 This shows eczema in the elbow crease of a teen. The skin is dry and may be itchy. It also shows loss of skin pigment (color), which may happen in people with dark skin. Eczema can cause the skin color to be darker or lighter.